At this year’s LIGNA fair in Hannover Weinig was a real attraction thanks to the competition that put up as a prize a four-side working machine Cube Plus. 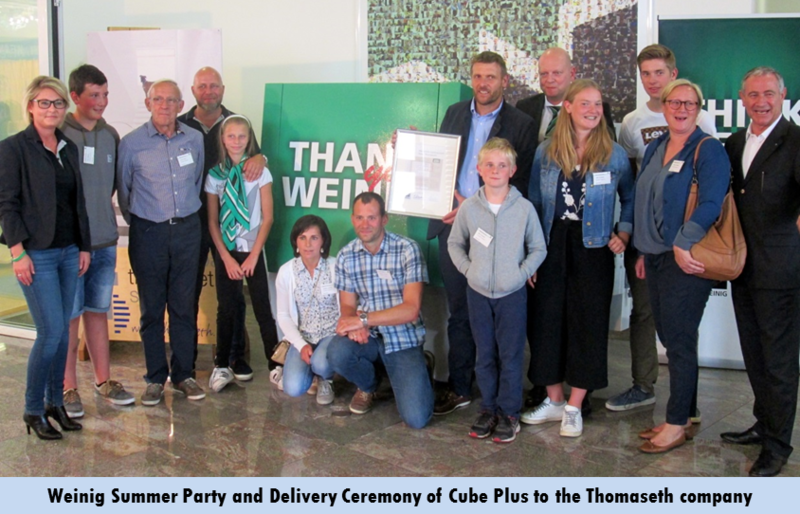 The machine was delivered to the winner of the draw, the Thomaseth Treppenbau company of Castelrotto near Bolzano/Italy, during the Weinig Summer Party, that took place at the headquarters of the company in Tauberbischofsheim on July 27th with the participation of over 700 guests. The winner and company owner Stefan Thomaseth attended the event with his family. Wolfgang Pöschl, CEO, Weinig and Gregor Baumbusch, Sales and Marketing Director of Weinig, congratulated him and delivered a commemorative plaque with the winner's original takeover coupon. Paola Govoni, Editor in Chief of World Furniture magazine from Milan, Italy, attended the delivery ceremony and the Summer Party in Tauberbischofsheim. The competition coupon was compiled by 2500 people visiting the Weinig booth at LIGNA in Hannover. "A great success," says Gregor Baumbusch. The range of prize gamers with whom Weinig wanted to thank the customers' confidence in the record 2016 year goes from the big industry to the small handicraft company. "The great resonance in companies of all sizes and all areas of application shows that machines such as Cube Plus have a real value for everyone," said Klaus Müller, Weinig Communications and Marketing Manager. The Weinig Cube has become a synonymous with simple planing and work pieces, that are perfectly processed on four sides in a single throughfeed. Winig’s Cube Plus receives great appreciation in every part of the world. The majority of the machinery so far has been sold in Great Britain. The customized paintings offered by Weinig as an option are particularly appreciated. LIGNA's winning equipment also has a special design in memory of the event.